We are exhibiting this April in Orlando, FL, at the MRO Americas exhibition for the first time in the event’s history. There will be 850+ exhibitors and over 15 000 visitors. We are joining forces with our local representative DAES Group, and their other capital equipment partners. Our stand 1154 is located in the main hall. Come and visit us in Orlando in April and learn more about our exeptional surface treatment plant engineering capabilities in the Engine MRO component cleaning as well as aircraft component manufacturing. Do you want to work in a responsible position, within a high technology company and in an international environment? We are looking for a Chief Engineer to join our mechanical engineering team located at our office in Lahti, Finland. Galvatek is one of the leading suppliers of surface treatment plants globally. We have delivered over 600 plants over the past 40 years. Galvatek offers customer-tailored plant projects, from design to turnkey delivery. We naturally offer comprehensive maintenance and spare parts services too. The latest technology combined with our long experience guarantee the reliability and quality of Galvatek plants. As Chief Engineer you will be responsible for mechanical design processes and general plant design. Your tasks will include also scheduling and detailing mechanical design work, as well as technical computations, defining and sourcing components, and creating technical documentation. When needed you will also participate in negotiations with clients and suppliers, as well as assist in planning and creating preliminary designs for quotations. We expect you to understand complex projects and manage the detailed design required to correlate the overall targets of the plant. You will report to the Design Manager, and you will participate actively in developing our design systems and methods (Vault/Inventor/AutoCAD). We expect you to have several years of experience in designing and managing large projects. This experience will allow you to make decisions and take responsibility. An MSc or BSc in Mechanical Engineering, Process Engineering or Mechatronics would be the ideal degree for this position. We expect you to have experience in mechanical engineering, and you should master both 2D and 3D design. You should also be fluent in modern software tools, preferably Inventor and AutoCAD from Autodesk, or at least you should have long experience in similar software, such as Solidworks. Any experience in an international work environment will be considered a benefit. We expect you to have strong communication skills, and you should enjoy working with people. You should be able to figure out the big picture quickly and organise work with our clients and suppliers. You should be fluent in both English and Finnish, and any other language skills will be considered an advantage. We offer you an interesting job in an organisation that always appreciates high quality. You will have the chance to use and develop all your skills. You will be working mostly with clients from the aviation industry who expect extremely high quality and reliability. We expect you to be a professional from the start, while our in-house and other training opportunities ensure that you will be the best expert in this business also in the future. In addition to design, your work will include also some research and development. We offer you the chance to travel internationally and to work with people from other cultures. Galvatek is a truly international company, and the majority of our products have been exported already for many decades. BCW Treatments Ltd on Innovation Drive in Burnley is an aluminium anodising facility opened in early 2015 to provide a full service to companies using the subcontract machining services of BCW Manufacturing Group’s machine shops on the same industrial estate. Anodising is carried out in a Galvatek automated finishing line supplied by Turbex, which was deemed to be the best all-round package of three alternatives considered. 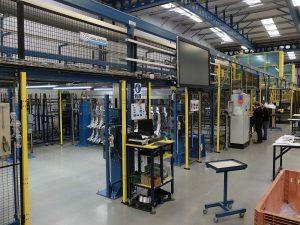 Currently, an average of 2,600 square metres of product per week are finished across more than 240 part lines. 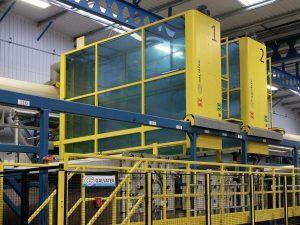 The Galvatek automated anodising line at BCW Treatments, Burnley. One of BCW’s automotive contracts involves the production of aluminium components mainly from A365 castings, 6060 extrusion, superplastic 5083, and 5754 sheet for a premium automotive customer in the UK specialising in manufacturing luxury sports cars and grand tourers. More recently, the subcontractor has received further business from another prestigious UK automotive customer that produces high performance 4×4’s and special operations vehicles. The work will start at the end of 2018 and entail the installation in an adjacent factory of a line for passivating components as a corrosion resistant pretreatment. Enquiries have also been received for finishing lightweight components for aircraft, such as cabin seating, and for electric cars, hybrids, amphibious vehicles and lorries. Consequently, by the end of the decade, the firm is destined to become a major force in component finishing in the north of England. Two overhead transporters dip flight bars carrying aluminium components into 15 tanks sequentially. Up to five jobs can be processed simultaneously in the line. An enterprise resource planning (ERP) system drives the finishing process in Burnley, raising each manufacturing order and triggering the issue of material. The line’s control system learns which aluminium products are mounted on which universal or part-specific jig by scanning the manufacturing order. Once it knows the part number, the correct program is automatically selected. There are four load/unload stations at one end of the line, where components are loaded onto flight bars that progress to a buffer station from where they are picked up by one of two overhead transporters and dipped into 15 tanks sequentially. Up to five jobs can be processed simultaneously in the line. Automatic dosing stations are provided for metered dosing of chemicals into several of the tanks, the quantity being worked out automatically according to the amount of surface area to be anodised on each flight bar. The working environment is clean and fume-free, as each tank is hermetically sealed and the lid is not opened until a transporter is directly above it. 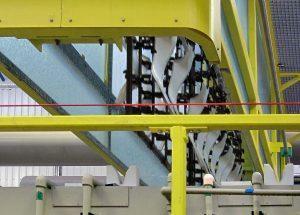 Positive pressure pulls the fumes through the handling system and extracts them to a scrubbing unit. After processing, flight bars are returned to four load/unload stations adjacent to the loading area and the test pieces are taken away for analysis, which includes pull and shear tests after adhesive has been applied. Following each successful test, the ERP system is advised that the components are ready to deliver to the customer. As a conveyor is not involved in transporting flight bars around the system, the anodising process starts in the centre of the line and progresses initially away from the load/unload stations. Alkaline degrease takes up to one hour in the first tank for the most soiled castings and the solution is rinsed off in town water in the next two tanks, the water being recycled between the second and third stage. A fight bar being lowered by one of the transporters into a tank. Tank 4 is a chemical etch using sodium hydroxide to remove pre-existing aluminium oxide from the surface of components. Immersion time is controlled to avoid unduly changing of the geometry of the components. It also precludes the need to plug holes, resulting in a cost saving and eliminating the risk of parts being returned by the customer if plugs are inadvertently left in at the time of delivery. An eco-rinse cycle in town water is performed in the next three tanks, again with recycling between the stages. The following process, which takes place at the far end of the line in tank 8, is the removal in a mix of nitric acid and hydrofluoric acid of alloying elements on the surface of components, especially of castings, that remain after chemical etching. Two further eco-rinse immersions in tanks 9 and 10 brings the pre-treatment to a close, by which time the components have travelled back past the centre tank towards the load/unload stations. The actual anodising stage of the process is in tank 11, which contains sulphuric acid, and lasts between eight and 10 minutes, during which time a nominal 4 to 6 microns film thickness is deposited. An ecological feature of the equipment is continuous dosing of the acid, instead of recycling the fluid when the aluminium content reaches say 20 grams per litre. Avoidance of waste is made possible by employing a pump to recirculate the fluid through a retardation unit, where the aluminium is filtered out. A clean rinse in three successive tanks containing deionised water, which is produced locally within the line, ends with an ultra-clean rinse to ensure that conductivity is less than 200 microsiemens. The last stage, prior to the flight bar being taken back to the unload station, is hydrothermal sealing at 96°C in a proprietary chemical blend. Reserved for high-end applications and involving 30-micron particulate filtration, the process seals microscopically small pores created on the surface of components as a result of dielectric breakdown during anodising. Newman Lane, Alton, Hampshire, GU34 2QL. Tel: +44 (0)1420 544909. Fax: +44 (0)1420 542264. Contact: John Huntingdon, Managing Director.